11:30 am. 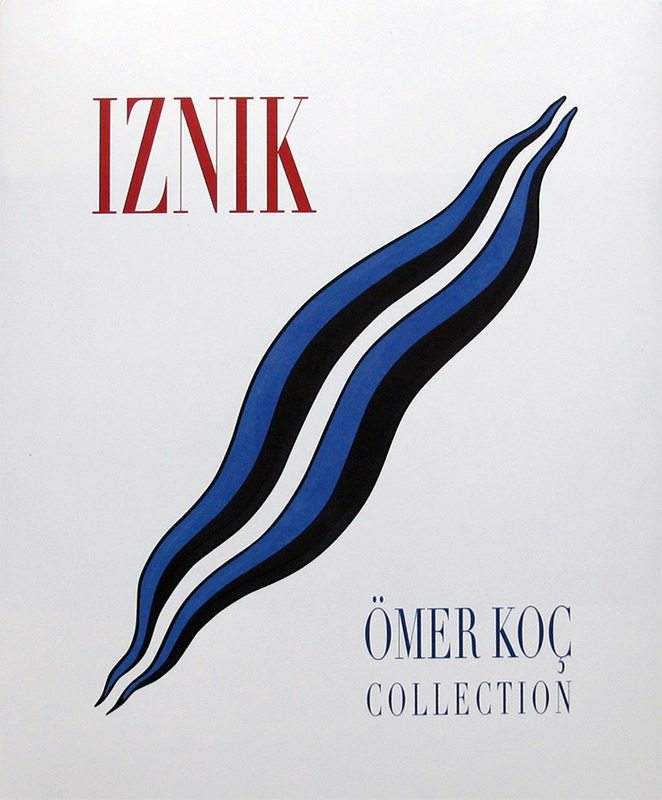 The sound of drums reverberated through the hills of Üsküdar's Kuzguncuk neighbourhood as a children’s band, comprised mostly of girls in white pleated skirts, red polo shirts and high-top sneakers, marched through the streets. Proud parents and onlookers followed, and men and women leaned from their windows to applaud. 2 pm. Fliers handed out by a young student called for a meeting at Istiklal –Tünel. The leaflet was endorsed by ten activist groups. 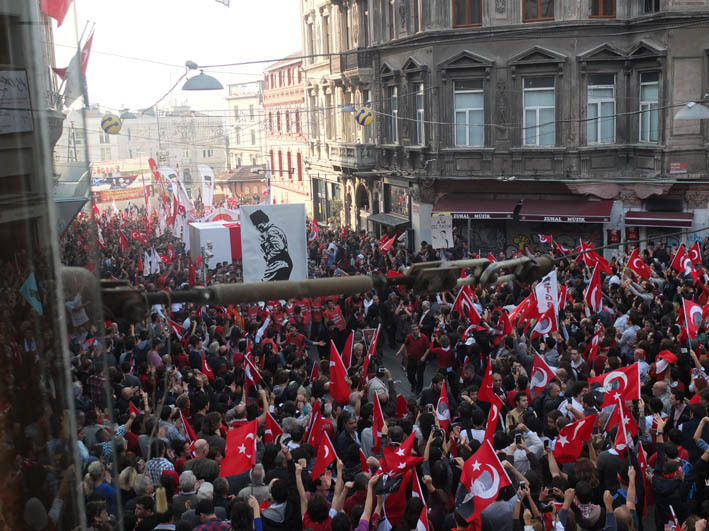 Blocked from entering Istiklal by police in riot gear and water-cannon trucks, the demonstrators spilled down narrow stepped alleys into a street below, where they chanted, ‘We are the soldiers of Mustafa Kemal.’ An hour later the square in front of the Tünel station began to fill. People danced to a drum and cheered as a man scaled a tall, metal sculpture to hang a flag. Just then, the group from the street below marched up the hill carrying a large banner of Atatürk and a big white box to face the line of police. 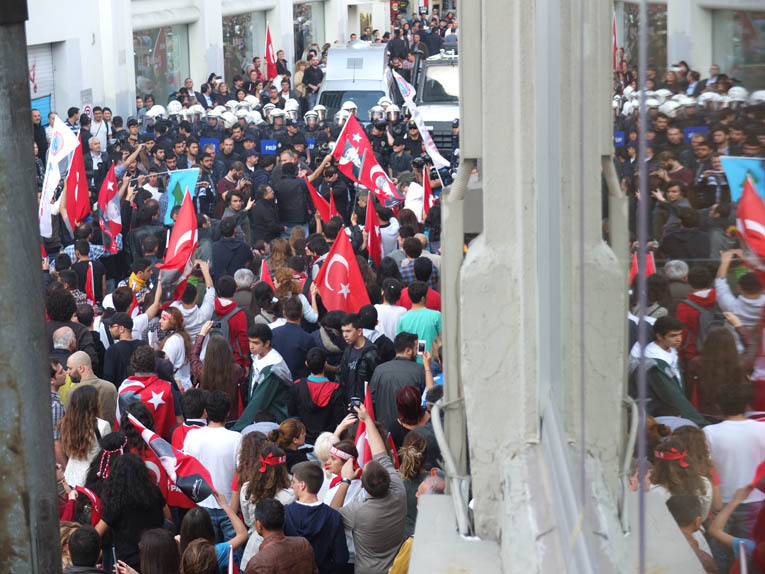 It was hard to find news of the event afterwards, though the Hürriyet Daily News noted briefly that the demonstrators were dispersed by teargas. 4 pm. 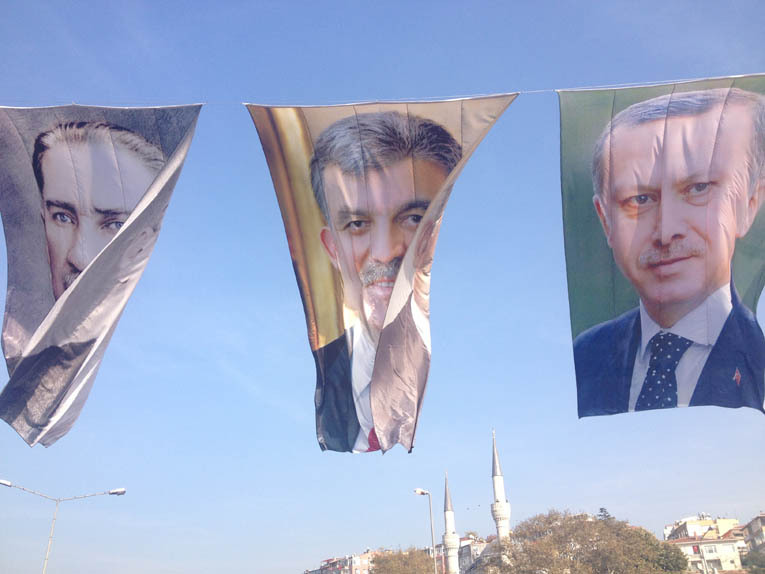 Publicity was not lacking for Erdoğan’s opening of the Marmaray Project, the main official Republic Day celebration. 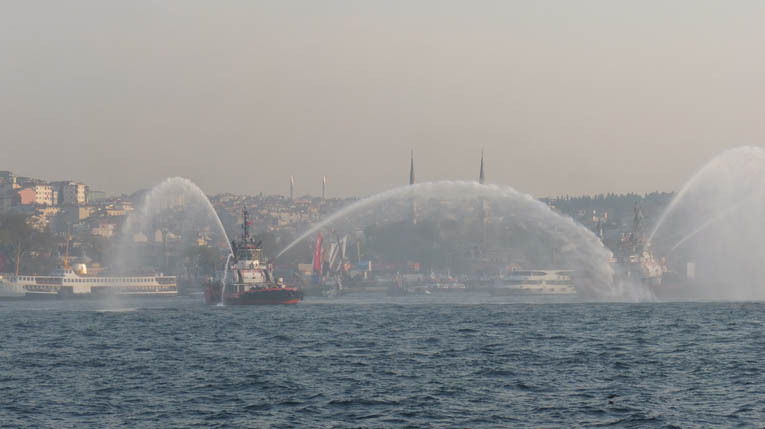 Seen from the ferry approaching Üsküdar, a line of coastguard boats sent plumes of water up into the air behind them like proud floating peacocks, as a large crowd filled the square in front of the new Metro stop at the tunnel entrance. A decade-long construction project, this tunnel under the Bosphorus promises to reduce commuter time to Sultanahmet to four minutes. Here a more sedate, more conservative-looking crowd milled in the large square, overlooked by the Mihrimah Sultan Camii, whose restoration screens had been removed just in time. 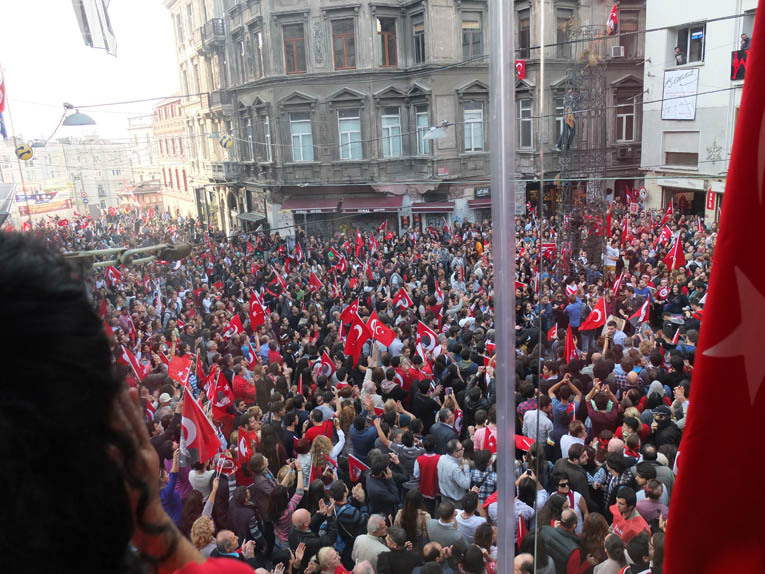 Erdoğan’s voice boomed across the square, speaking of the Ottoman dream of an underwater Bosphorus link and of the even larger transportation projects that he himself envisions. 6 to 10 pm. 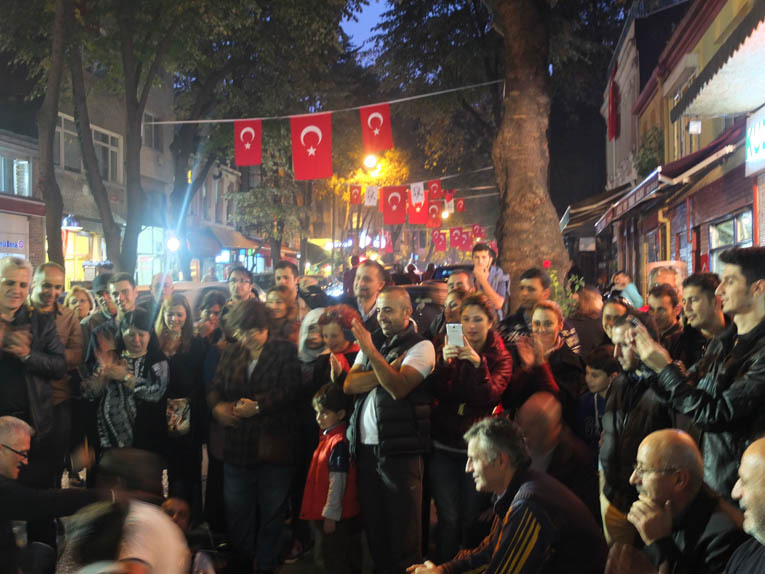 Back in Kuzguncuk, more light-hearted Republic Day celebrations continued with joyous street dancing, delicious food and mobs of people leaving their cars in the middle of the road as they rushed to watch the fireworks. 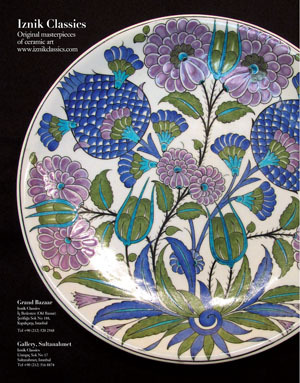 ‘I feel like I’m in a dream,’ said the indefatigably cheerful chef and proprietor of Blue Betty – all her tables happily full. Alice Greenway is the author of White Ghost Girls. Her second novel The Bird Skinner will be published by Grove Atlantic in January.